Unmanned 'Killer Robots': A New Weapon in the US Navy's Future Arsenal? 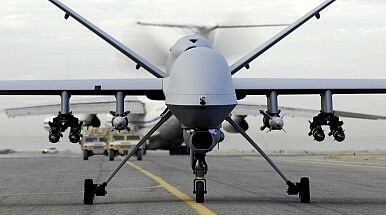 The US Navy moves unmanned drones to the top of its priorities. “Additionally, the Navy Staff will add a new office for unmanned in the N-9, the N-Code for Warfare Systems, so that all aspects of unmanned – in all domains – over, on and under the sea and coming from the sea to operate on land – will be coordinated and championed,” the secretary noted. Imagine a swarm of buzzing, scuttling or swimming robots that are smaller but smarter. While a human has to fly the Predator by remote control, these systems would make decisions and coordinate themselves without constant human supervision — perhaps without any contact at all. The key here is how those systems will communicate. “For swarming to work, I don’t think we can be dependent on the RF [radio frequency] spectrum…. We’re seeing more and more every day that that’s vulnerable. We can’t go down the primrose path that we’re on with dependence on RF spectrum. For his future fleet of small unmanned autonomous “swarmbots,” Killea sought inspiration from nature, particularly the way termites coordinate without communicating: “Without communicating they sense the environment change around them, and they instinctively know which way to go,” – termites release scents for other members of the hive to sniff, who can then react instinctively to danger. In discussions on lethal autonomous weapon systems at the United Nations (UN) Convention on Certain Conventional Weapons in May 2014, “meaningful human control emerged” as a major theme. Many who support a ban on autonomous weapon systems have proposed the requirement of meaningful human control as one that ought to apply to all weapons, believing that this is a bar that autonomous weapons are unlikely to meet. The report further points out that real problems will arise holding people accountable for wrongful actions of autonomous weapon systems (e.g., striking the wrong target) – an “accountability gap” as the study calls it. Thus, technological problems may perhaps be only one obstacle to overcome before the future use of autonomous “killer robots” in the U.S. military. A new robotic platform will be capable of carrying out a host of tasks, including reconnaissance and patrol missions.